Like many cities, Mongolia’s capital is plagued by heavy pollution. For Dr. Lodoisamba Delgerzul, a trained medical doctor now working for the Faculty of Public Health at Mongolia National University, improving air quality and creating a healthy future for all Mongolians is a vital mission. Dr. Delgerzul recently returned to Mongolia after spending three weeks in the United States as part of the Leaders Advancing Democracy — Mongolia (LEAD Mongolia) program, which brings together Mongolia’s up-and-coming democracy advocates to share knowledge and insight about their country’s most pressing challenges. Dr. Lodoisamba is addressing the impact of pollution on Mongolian citizens. In late January more than 1000 protestors gathered outside the nation’s parliament building to demand government action in combatting the air pollution problem. 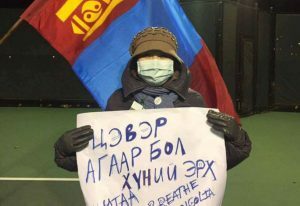 To coincide with this demonstration, participants of the LEAD Mongolia program held their own peaceful rally at the University of Virginia. They held signs saying “Air pollution is everyone’s problem!” and “Clean air is a human right! #AirPollution #BreatheMongolia”.